What’s Up With Stew-pid People? 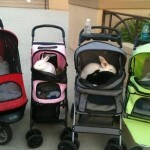 Seven buns out for a walk at the street fair last week. Now I actually have no problem with rabbits who are raised for food and eaten. I am not a vegetarian and so I cannot expect other non-vegetarians to not eat rabbit. What I have a problem with is someone inferring that they want to eat my pet rabbit! To me this is no different than if I was from an Asian country where they eat dogs regularly and coming up to an American to tell him that I want to eat his German Shepherd for lunch. I think it is a cruel and crass thing to say to someone about their pet, regardless if it is a dog, rabbit or pet pig. Yet, rarely will a week go by when I do not hear someone tell me this. I find it appalling and rude, to say the least. Most people say it as if they were making a joke, but more often than not, there is a slight tone of being mean spirited with their sarcastic statement. My wife and I are very quick to reply that we do not find this funny at all. Some people just smirk and laugh because they know that their arrow hit it’s mark. I used to just ignore people when they used to say it to me, but I am a believer that ignorance should be painful and if I could give the person a Benny Hill slap upside the head, maybe it would make them think twice before saying that to another pet rabbit owner. 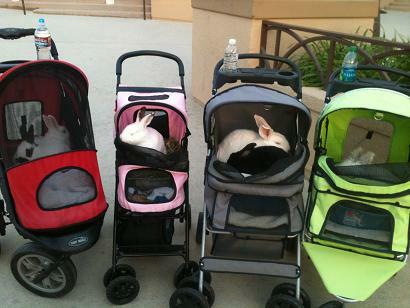 So please do me a favor; if you see me with my rabbits out for a walk in their strollers, please do not approach me to tell me that you want to eat my rabbits. It just tells me that you are truly a stew-pid person with no regards for other people’s feelings.